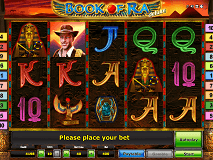 This is a Novomatic slot game developed following the massive success of Book of Ra, the original and first in a line of the Book of Ra slots collection. 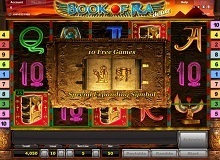 Book of Ra Deluxe slot game is based on the Ancient Egyptian tales. History tells us that in days gone by in the land of Egypt, there lived Pharaohs who were extremely rich. They had huge silver and gold reserves. During their time, they were the wealthiest people on earth. However, history also tells us that a few years after the last Pharaoh died, the wealth disappeared, the huge silver and gold reserves suddenly became empty fortresses. Inspired by these tales, a Western archaeologist in Book of Ra undertakes a journey to Egypt to uncover these tales and try to recover Egypt’s lost treasures. As you start spinning the five reels and ten paylines of this slot, you will also join the archaeologist on his adventure, and if you help him to locate the treasures, you will be rewarded handsomely. This slot game has a gold feel. The background of the game is covered by a solid black colour, but the reels of this game depict a golden temple. At the top of the screen is a game logo icon while at the bottom is the control panel with all the necessary buttons you need in playing this game. How to Play Book of Ra Deluxe? 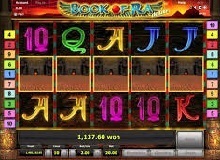 Book of Ra Deluxe is playable both for free and for real money at several casinos online. To start your adventure wagering for real money, you will need at least 1.00 coin. Book of Ra Deluxe comes with adjustable paylines meaning you can wager with just 1.00 coin on a single payline. However, if you are aiming to win more money, you can increase your bet per line up to 100.00 coins. If you also want to increase your ways of winning, you can increase your paylines up to 10. This means if you want to play across all paylines wagering the min amount you will need 10.00 coins and if you want to play across all paylines wagering the max amount you will need 1000.00 coins. Once you set the number of paylines you want to wager on, you can proceed to click the ‘Start’ button which sets the reels in motion. There is also an ‘Auto play’ button for spinning the reels consecutively. The Book of Ra symbol represents the Wild. This icon has the capabilities to change itself and take the form and shape of any other symbol, and in the process, it completes a winning combination. In addition, matching five of these of the reels will earn you an 80x multiplier. The Book of Ra symbol also represents the Scatter symbol. Play Book of Ra Deluxe slot machine online, you can look forward to some entertaining bonus features that also increase your chances of winning. Three of the Book of Ra Scatter symbols trigger the free spins bonus. In this bonus, you receive ten free spins. The beauty of this bonus, however, lies with the expanding symbol. At the start of the bonus, you are prompted to choose one symbol that you want to expand during the bonus. Each time you win, the symbol will expand, and in the process help you match more winning combinations. After each win, you have the opportunity to double up your win via the Gamble bonus. All you need is to predict the colour of the card to be picked, and if you predict correctly you double your win. The archaeologist symbol rewards you the most. Just two of these of the reels earns you 0.40 credits, three earns you 4.00 credits, four earns you 40.00 credits and five earns you a massive 200.00 credits. The Sphinx symbol earns you 0.20 credits for two on the reels, 1.60 credits for three, 16.00 credits for four and 80.00 credits for five. 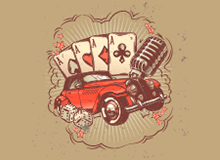 The golden crown and the beetle earns you 0.20 credits for two of a kind, 1.20 credits for three of a kind, 4.00 credits for four of a kind and 30.00 credits for five of a kind. The poker symbols in this game pay the least. This is an absolving game that will keep you glued to the screen of your device for hours! This is a medium volatility slot with a 95.1 RTP. Book of Ra Deluxe is playable for real money or for free.